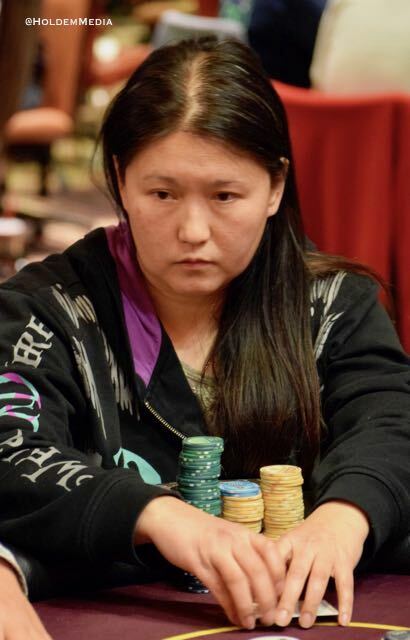 Bob Mather is all in with KT on a Ten-high board, but Ting Ho - QueenOfSets - has QQ and she knocks Mather out with 30 minutes left in Level 8, the final level of play for tonight. Wawa Ho's mom beat out Ellie The Pup's dad this time around. Ho on her way to register Friday for the OneDay$100,000 Guaranteed, as recommended by Rex Clinkscales. I've watched her satellite her way in to Main Event after Main Event with ease, so I suggested she play Friday's 15-seat-guaranteed satty into the Main. Move to 104,000 chips, she did.